Ibrahim Mahama has been participating in the Occupy Atopos Residency from January 11 to April 30 2017. 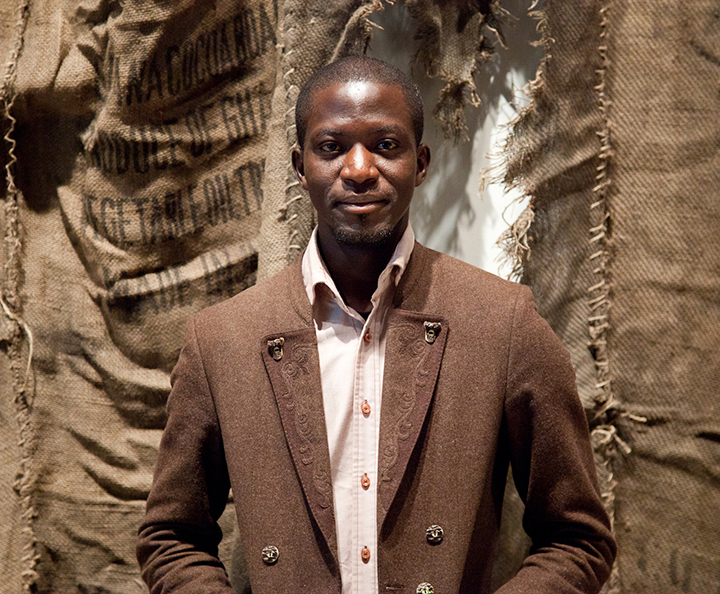 Ibrahim Mahama is an artist who lives and works in Tamale, Ghana. He has recently enrolled in the PhD (Studio) programme in the Department of Painting and Sculpture, Kwame Nkrumah University of Science and Technology. In 2012 he began producing “Occupations”, a series of itinerant installations made in collaboration with migrant communities using industrial materials, namely jute fiber sacks used to carry various commodities. These sacks are introduced into spaces and begin to question the systems of production and the very sense of occupation. Architecture plays the role of both protagonist and antagonist in these immersive yet very temporal projects. His work has been included in a number of group shows including “Pangea I and Pangea II” Saatchi Gallery, London and “Silence Between The Lines” in Ahenema Kokobeng, Kumasi, “the Gown must Go To Town”, Accra and the “56 Venice Biennale.” In his most recent work he questions the place of modern architecture within two cosmopolitan cities in Ghana using the subtle choices of form, time and with the help of his network of collaborators. Failure and crisis are fundamental to his production processes.